Katrina is coming. I'm anticipating many days without electricity and lots of sweating. I think I'm too nervous to craft. With no computer and TV I may get a chance to quilt the little quilt top I made Friday night. Maybe do some hand sewing? I duno. Argh! This is so nerve wracking! It's almost fall, my favorite time of year. Others get spring-fever, I get fall-fever. When the school busses start to roll I get energized (and no, this has nothing to do with my kids going to school because they're too young to for that just yet). I start cleaning, organizing, redecorating, and making things. Maybe this is in preparation for the long hard winter we get down here in south Louisiana. Yeah, right! Fall marks the beginning of the year for me, not January. I guess it has some correlation with the school year, I dunno. I think it has more to do with preparing to spend more time at home indoors with the shorter days and the upcoming holidays. This is such an exciting time! Despite the extreme heat we've been experiencing lately, I've already started burning my pumpkin spice candles. I am soooo ready for fall! My weekend was satisfactory. It started out great Friday night with a trip to the mall. I found some awesome deals on some placemats to make some more purses. I can't wait to get to those, but I need to find some handles. I really need a new purse for myself at the moment, but I'm holding out for an Amy Butler bag. I ordered some bag patterns that should be here any day now. We ended the evening with dinner at a local Mexican restaurant. Oh, how I love Mexican! Saturday wasn't so great. I woke with sinus pain, so I took some stupid sinus medicine. Big mistake. Not only did it knock me out (even the non-drowsy does it to me), but it made me feel like crap. On top of that I was a total grump. 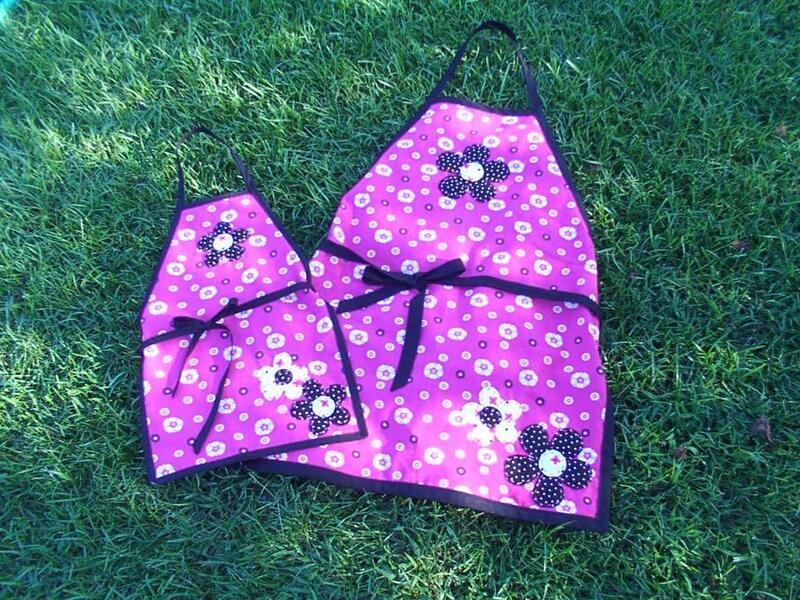 I did manage to finish my and Lily's aprons, so that was an accomplishment. I wanted to use a fancy stitch to applique the flowers on to the aprons, so I pulled out a book my grandma gave me, The Encyclopedia of Stitchery . There was some cool stuff in there, but I ended up using a regular old stitch. I think the fabrics were too busy for anything fancy. I promise I'll get pictures up soon. For some reason I ended up staying up until 1 am. Soon after I went to bed Lily woke up. She was in a total tizzy because the sponge curlers we put in her hair before bed were falling out. I tried to tell her that it was no big deal, but she then had a total meltdown. I have never seen her like that. It was NUTS!! I eventually got all the curlers out of her hair, which she didn't want me to do. After finally getting her to bed around 2:30 am she woke up again around 4 am because a big thunder storm rolled through. Needless to say, none of us got much sleep that night. Sunday morning we all slept in. I didn't even get dressed until lunch time and I never fixed my hair. It's nice to do that every once in a while. It was rainy and gloomy all day, so it was the perfect day to do that. Lily woke up in a good mood and was disappointed that we weren't going to church. She must be possessed. The big accomplishment of the day is that I got the table out of my bedroom. I thought that the table would be too big in my living room, but it isn't so bad. There's no hurry to make it smaller. In fact, I may never make it smaller, just use it like it is. Yeah, I still need to do some accessorizing, but it's fine for now. Matt also finished painting the bathroom. Now he needs to put down the shoe molding, then it will all be done (for the most part - there's always something else that needs doing). The weekend is over, the work week ahead is near. I need to get to bed. Good night. I am so in love with AmyBulter fabrics! I just received my first ones and all I can say is that they're fabulous. They're still folded up in a pile in my kitchen. Every time I pass them I have to reach out and fondle them. I have no idea what I'm going to do with them, but for right now I want to spread them out all over the floor and roll in the yardage. The ones I got are all from the Ginger Bliss line. I can't wait to get some from the new Charmed collection. I am officially addicted to these fabrics! You'll have to bear with me, I'm feeling a bit sentimental at the moment. Here are my kids (the ones I don't talk about much). How did I get so lucky? I am amazed that I have two beautiful, healthy children when only 5 years ago I thought that I'd never be able to have kids of my own. Before I had Lily I had 3 miscarriages. They were devastating. I felt like such a failure. I couldn't understand how people so easily got pregnant and stayed pregnant. I was big ole misfit. Numerous tests were done, but nothing was found wrong. I finally gave up. Instead of praying that I could get pregnant and carry to term I prayed that I could become a mom, no matter how. I finally accepted that I may not be able to have kids of my own. Then I got pregnant for the 4th time. It was a rough time. As usual, I started bleeding in the first trimester. 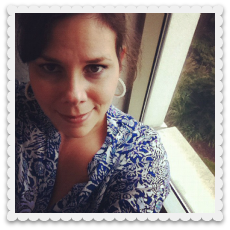 I was put on bedrest for about a month until I made it to the second trimester. After that everything was fine. In May 2001 I gave birth to a whopping 10 lb 2 oz baby girl we named Lily. I remember the sense of peace that came over me after she was born. I couldn't believe that I was actually somebody's mother. Though it took a while for us to know each other, mothering her came naturally to me. I'm not really a 'kid' person, so this was a surprise to me. As soon as Lily was born I knew that I wanted to do it again. When Lily was about 15 months old I got pregnant again. My due date was her 2nd birthday. That ended up being my 4th miscarriage. I didn't take that loss as hard. Having Lily and knowing that I can have a baby made all the difference in the world to me. Once I got the okay from my OB we started trying again. We were having a tough time. I finally went on clomid ( I used clomid for Lily's conception) to help me along. After a few months of no luck with being on super high dosages we decided to take a break before we decided on our next path. At the consult appointment with my OB we decided that I'd have an IUI (intra uterine insemination) on my next cycle. She joked that I may not need it because I could be pregnant at that very moment. "Yeah, right" I said. That was on a Friday and I tested positive the following Monday. That pregnancy was relatively easy, except that I was diagnosed with asthma and gestational diabetes. Due to my history we scheduled a c-section at 38.5 weeks. 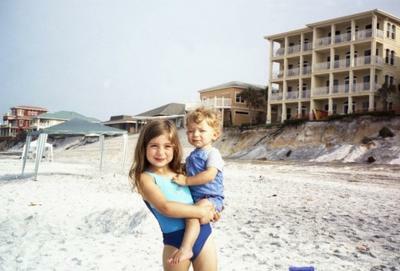 Alex was born weighing in at 9 lbs 6 oz in June 2004. What a sweet little boy he is! I am now a mother to two wonderful children. Yes, at times they make me want to pull my hair out and bang my head against a wall, but I couldn't have asked for more perfect children. I am truly blessed. ** Warning - this is an extremely boring post. Today I got a glimpse of how my life would be if I were to stay home. I must admit that it went much better than I expected. I got more accomplished house-wise than I thought, but hardly anything cafty done. When I decided to stay home this morning my first thought was that I'd get to finish my Tie one On aprons, but that didn't happen. Instead I got to spend some quality time with my kids and take a much needed afternoon nap. Yeah, I think I could get used to this. 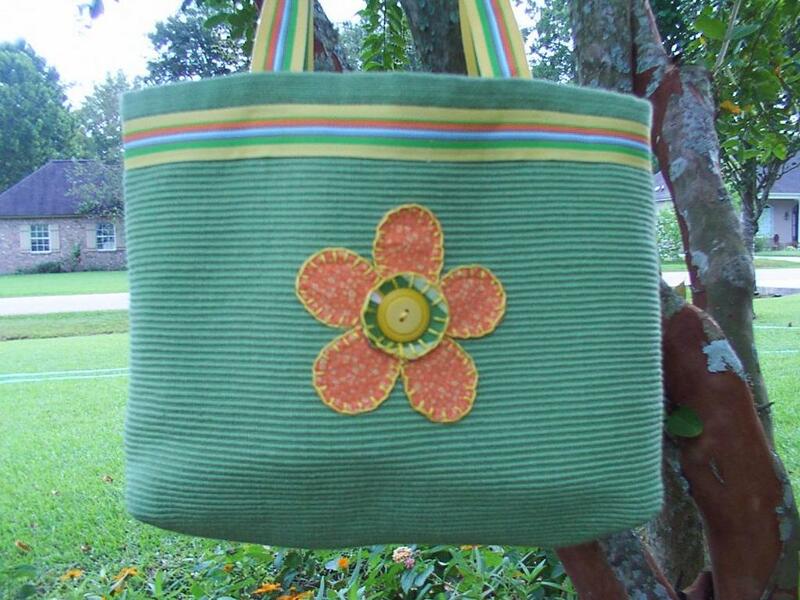 Here are the pictures of the green bag I appliqued last night. 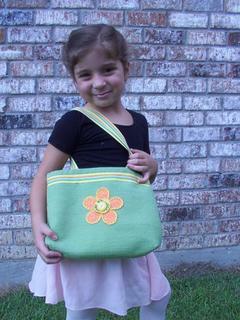 Here's my little ballerina using her new bag. Yes, that's frosted pink lip gloss she's wearing. Heathen mother that I am, I allowed my little girl to wear make up to her Christian dance school. It was the only bribe I could come up with to make her go. Oh, the horror! I am happy to report that I had a very productive night! 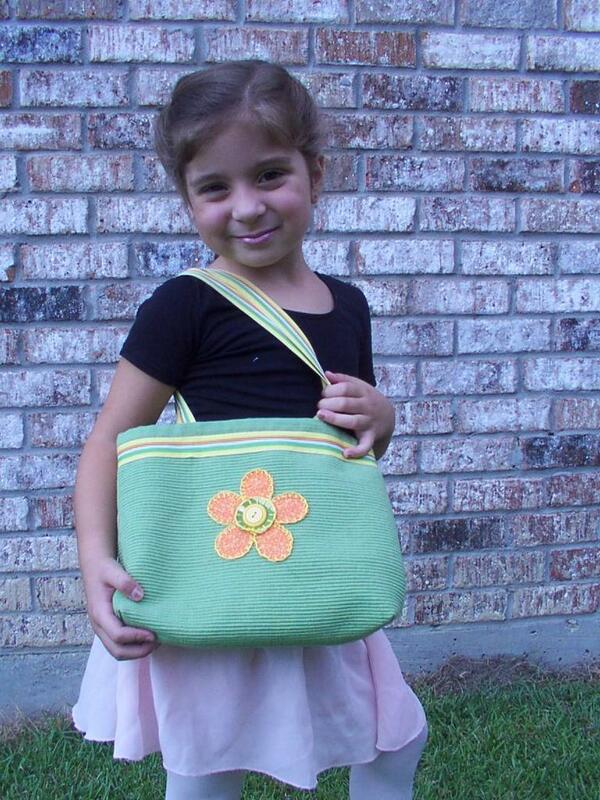 I did my first applique on that little green bag. Since tomorrow is Lily's first dance class I felt the pressure to get it finished. 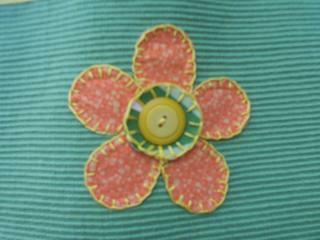 I appliqued an orange flower with a green center topped with a yellow button. Though my blanket stitch sucked it still came out cute. Somehow I managed to reverse the stitch, so parts of it came out wonky. Oh well, she'll never notice. I'll post a picture tomorrow when I can take one in natural light. 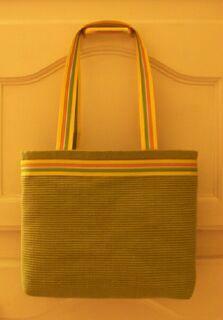 I didn't want to post another crappy picture of that bag with skewed yellow lighting. After finishing the bag I cut out the appliques for our aprons. I can't wait to get that assembled. It's going to be so cute! I'm not sure If I'm going to use a blanket stitch around those flowers, though I could use the practice. I want something that will be pretty on the reverse so that the aprons can be reversible. Hmm, I'll have to think about that. I really can't complain about how things are going at the moment. Yes, my 4 yr. old is having a terrible time adjusting to her new preschoool, but other than that things are fine. There was a time in the not so distant past where I was really unhappy, mostly about my day job. There's nothing wrong with the job, I just don't particularly care for it. There are times when I resent my job because it keeps me away from my family and away from doing artsy-crafty things. I have a fantasy that if I wasn't working then I'd have all the time in the world to do fun things with my kids and get around to all those projects that I have going on. But this is only a fantasy. I was a SAHM for 2 years. Though I really enjoyed that time with my daughter, it was hard work. I was lonely. I didn't get around to doing many projects because I had to take care of my daughter, clean the house, cook supper, and do the million other things that SAHM's do everyday. I was pooped at the end of every day. And I was BROKE. Yeah, having money is one of the few positives about working. That and the adult interaction. I'm lucky to work with some really great gals. If it wasn't for them I don't know how I'd make it through the day. No major changes have taken place. I think things are better because I'm making them better. I know that I need to have a creative outlet. When I don't I get very unhappy. I think that was a big part of my unhappiness. 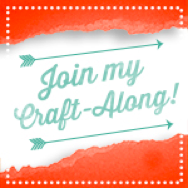 Since I started this blog I have made it a point to get crafty. I like when I have a new project to talk about. It gives me that sense of accomplishment I so long for and rarely get through my day job. So for now the day job stays, routines with the kids are established, and my craft time starts after the kids go to bed. Yeah, this will work...for now.